“The Viper is not for everyone. We knew that going in. This car is for the enthusiast who wants a great driving car and nothing more. Rome wasn’t built in a day; nor was the SoCal Viper Club. The folks who have donated their time to take on the leadership of the SoCal Viper Club have done so out of love of the Viper and a desire to promote the driving experience of the Vipers. With Vipers having no traction control up through 2011, and so much torque and power, the SoCal Viper Club has always been passionate about helping Viper owners learn how to safely drive their cars. The Car Control Clinic has become a popular annual event that helps Viper owners learn their limits with these cars. The many track, social and driving events the SoCal Viper Club provides throughout each year gives all members an opportunity to enjoy and learn about their cars as well as to socialize with other Viper owners.. Prior to 1996, there were 2 Viper Clubs in Southern California. The one in the Los Angeles region was founded by Drew Alkazar, who later went on to run the Steele-Russo Auctions. Marilyn Cocolin was the President and founder of the San Diego Club. She also produced the first VIPERFEST! at Coronado, which became the model for all future Zone Rendezvous. Professional photographers and delegates were sent by Dodge to document the event, and to observe first-hand the enthusiasm of the new Viper Nation. In 1996 the President of the San Diego Club was Frank Creede. Lou Neise was the Los Angeles President. Paul Hawker could see that the two clubs would benefit from a merger into one big powerhouse. Paul was elected President with the joint agreement between the two clubs of merging them into the Southern California Viper Club under the Viper Club of America’s new Regional Club Program. Membership grew rapidly after the merger. The prime directive of the SoCal Viper Club was then, and always has been, TO ENHANCE THE VIPER OWNERSHIP EXPERIENCE. 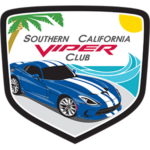 Thanks to the efforts of the past Presidents as well as the enthusiasm and outright friendliness of the Southern California Viper owners, as of 2010 the Southern California Viper Club is the largest Viper Club in the world. WE ARE VERY FORTUNATE AND THANKFUL TO HAVE GREAT SPONSORS WHO SUPPORT OUR CLUB IN MANY WAYS. FIND OUT ABOUT OUR EVENTS AND VIEW PHOTOS FROM PAST EVENTS. We are revving up the motors for this year’s Holiday Party and given the amount of energy and chest pounding exhilaration that John Force always has, we thought this would be a great place to host our annual party. NOW WHAT? ENHANCE YOUR OWNERSHIP EXPERIENCE BY JOINING THE VIPER OWNERS ASSOCIATION (VOA)! DO YOU HAVE SOMETHING EXCITING TO DISCUSS WITH OUR COMMUNITY?